Another one of the small publishers you don't want to miss at SPX is Koyama Press, whom I was first introduced to last year. The brainchild of Annie Koyama, it's been around since 2007, but I've only recently begun to see just how good their books are. Don't just take my word for it--look at this murder's row of creators she's worked with: Colleen Frakes, Dustin Harbin, Ed Emberley, John Martz, Joseph Lambert, Julia Wertz, and Michael DeForge, just to name a few. There's a great variety in styles and themes among the artists in Koyama's catalog, ranging from those who work in fine detail like Harbin to the more abstract work of Mickey Zacchilli. 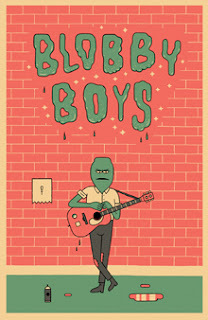 Blobby Boys by Alex Schubert is what might happen if Daniel Clowes got injected with the spirit of Johnny Ryan. Nick Gazin compares Schubert to the pair of iconic indie comic creators, and I think the assessment is spot-on. This collection shows he has the re-occurring short comics style of Clowes but the outrageous sensibility of Ryan, as his characters go past the restrained unpleasantness of Clowes and into downright outrageous territory. The Blobby Boys are loosely a band, but they tend to just get in a series of messes, entangling themselves into trouble via a heavy drug habit and inability to do the right thing. They're surrounded by supporting characters who are no better--like a reviewer who only trashes things. These adventures often end up going into absolutely insane territory, such as when their manager reveals without any hint or warning that he's screwed them over because--he's a dinosaur! It's that level of zaniness that makes Blobby Boys so much fun to read. You think you're just dealing with unpleasant losers, and then batshit insane stuff happens and the next thing you know, a homicidal robot shows up. I kept laughing as I hit panel after panel of things that made no sense whatsoever and marveled at the brilliance of Schubert's ability to slam on the emergency brake and take the story in a different direction or just stop it altogether. That's the thing that pushes this one apart from Ryan and Clowes and makes it better than both, in my opinion. Schulbert doesn't just create a series with unpleasant characters. There are a ton of people who do that, some better than others. He's decided to add a sense of almost Dadist absurdity to the mix, which I found incredibly original and compelling. I'm sure others have tried that, too, but this one works because you can tell a lot of thought and effort has gone into the gags. Plus, any person who slips in a reference to the Zine Police is okay by me. Artistically, Schulbert's work is very basic, and the structure of his panels and multiple storylines definitely shows a strong Clowes influence. It's a bit more square than Clowes (Box Brown is probably a good reference point here) and the coloring is often unusual and garish. He's very good at using space to make it part of the story and the consistency of the work is extremely strong. Blobby Boys won't be for everyone, but I loved it, and I'm not normally a fan of this genre. To me, that makes it worth checking out at SPX this year. 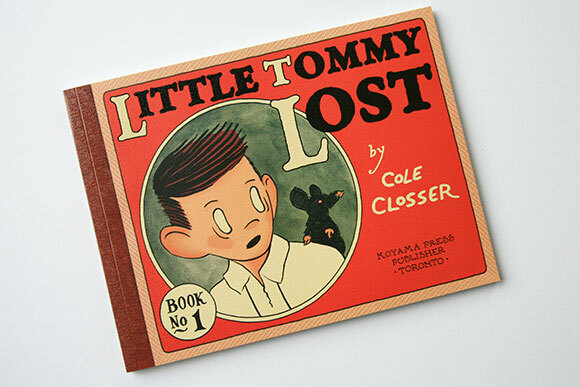 Little Tommy Lost Book 1 by Cole Closser could not be more different from Blobby Boys. I actually had to check several times to remind myself I was not reading a collection of work from the 1920s. Closser, a graduate of the Center for Cartoon Studies, completely fooled me into thinking that this book could truly be a lost treasure from the days when the comic pages were of a size that allowed the artist plenty of room to explore a rich visual canvas within the newspaper. Little Tommy Lost, put together as a series of newspaper-sized strips (complete with larger "Sunday" pages), is the story of a boy who gets separated from his family and ends up in a workhouse that has a sinister side project that may in fact be killing some of its occupants. Every single comic is given a tarnished wash, to imply it came from an old paper. There are titles above every strip, just like the stories its meant to homage. The word balloons are made to look as vintage as possible. Closser gives his characters blank eyes, draws certain characters in exaggerated shapes to highlight their personalities, and uses visual gags like dotted lines for eyesight and even daggers to represent evil intentions. It's amazing work by Closser, who not only manages to ape the feel of something that feels like a contemporary of Krazy Kat, he tells an exciting story along the way. Tommy is a fighter and is a plucky, Dickensian child who doesn't accept his fate. He faces real dangers, too, that are period accurate. Things like isolation and exploitation were a way of life for children in his situation. Besides just a few moments were the story feels like it slips out of character, the only way this one gives up its secret of not being from the early 20th century is in the overall feel of the story and its lack of stereotyping. As far as I'm concerned, that's a good thing. Little Tommy Lost is a fun comic that I would declare okay for all ages, maybe with a bit of supervision. It ends with the promise of more, and I hope we see that. Anyone who loves newspaper strips really needs to budget a mere $15 to take this one home with them. It's a must-purchase if you count yourself in that category. These are just a few of the Koyama books that should be available at the show. I'm sure Annie will have copies of Deforge's Lost series, Wertz's book from last year, and other great titles from the Koyama catalog. Lost your way and can't make SPX? You can find Koyama Press online here, which also has information on purchasing their books.